This iconic bust of Nefertiti was reconstructed by photogrammetry, solely from images found on the web. Hundreds of photographs can easily be found (e.g., Google images, flickr) … but only a handful of photographs are available for the back and the top of the bust. This explains why the reconstruction is not so good for these sides. Fortunately, lighting can be adjusted in Sketchfab and the final result is rather satisfying considering the limited resources used to build this 3D model. Softwares used: VisualSFM, MeshLab. See the YouTube tutorial “3D scanning for free!” by Phil Nolan to learn how to use these free softwares. 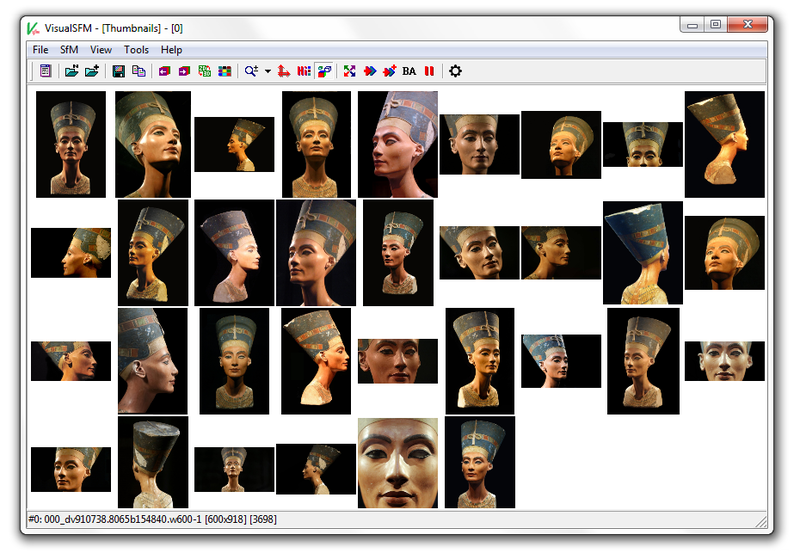 Screenshot of VisualSFM: Application used for this 3D reconstruction from photographs found on the web.